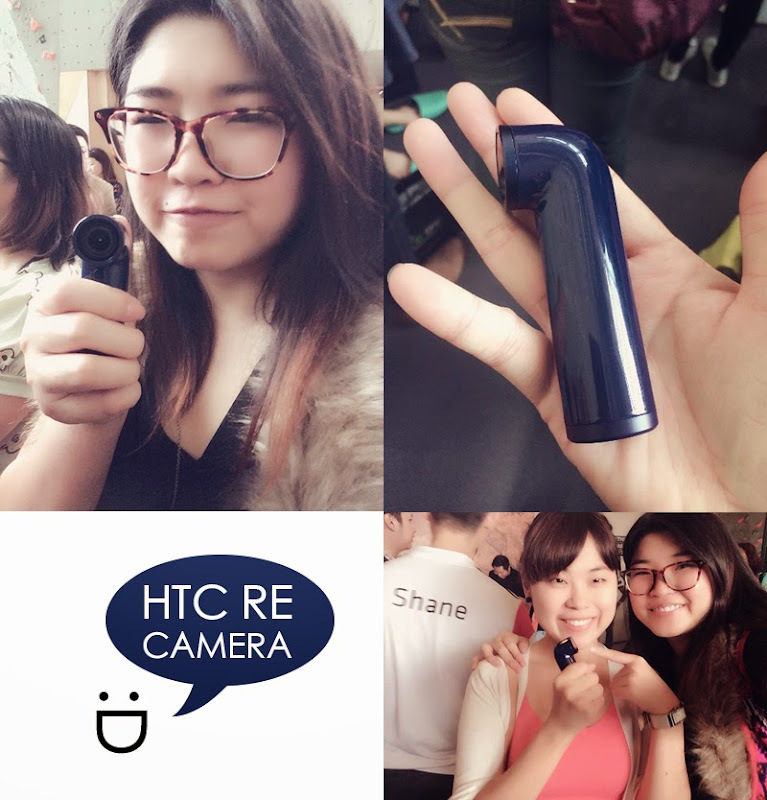 Recently I attended the media launch of HTC's latest products - the HTC Desire Eye and HTC Re (camera). These two products as I discovered is how HTC is going to break into the mobile photography market. Obviously they know we consumers just love taking selfies of ourselves wherever and whenever we are, making cameras obsolete now for normal human beings like me. 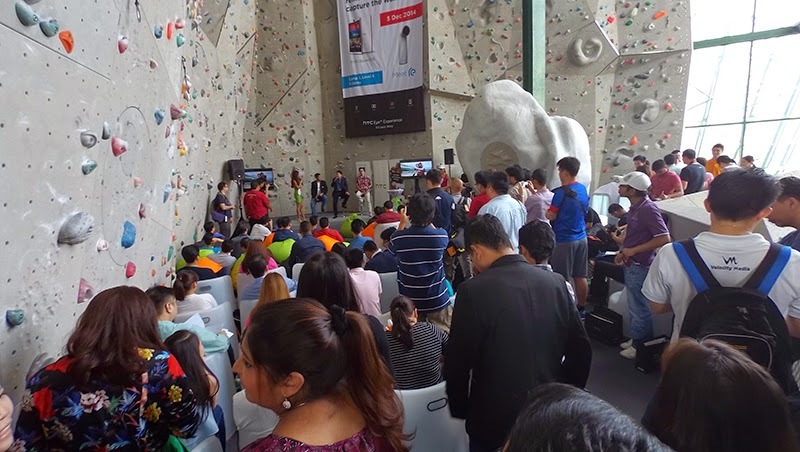 Strengthening our obsession, the HTC Desire Eye is equipped with awesome selfie apps (k it's called imaging software) dubbed the HTC Eye Experience. The HTC Desire Eye RM1699 comes in two cool colours to distinguish itself apart - Submarine Blue and Coral Red. The one cool thing about this selfielicious phone? It comes in 13mp cameras BACK and FRONT with dual LED flashes! (apple why u no do this too?). Read all about HTC Desire Eye from their website. 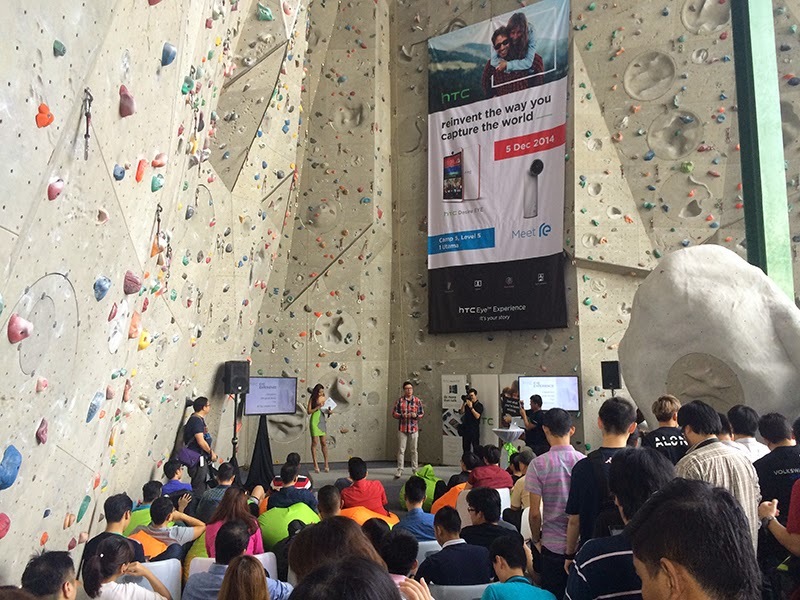 Next the HTC Re camera RM699 which got my attention as I was clicking it away at the event doing some live testing. 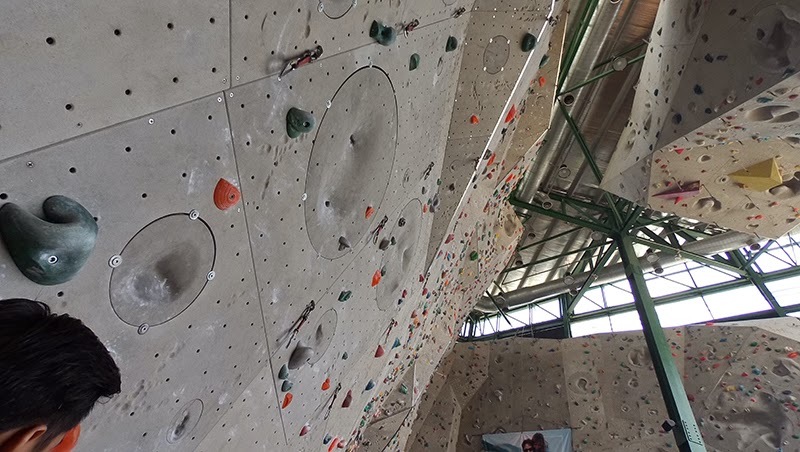 The HTC Re camera is a hand held camera not to be look down upon. It packs a 16MP CMOS sensor, full HD 1080p video recording, 146 degree wide angle lens and slow-motion and time lapse recording. Also there's no need for on / off button now, this baby automatically saves your battery by shutting off when you're not using. Upon gripping it, it comes alive back. You can take 1,200 16MP pics / 100mins HD video recording. What nowadays people take pics without looking at the viewfinder ka? 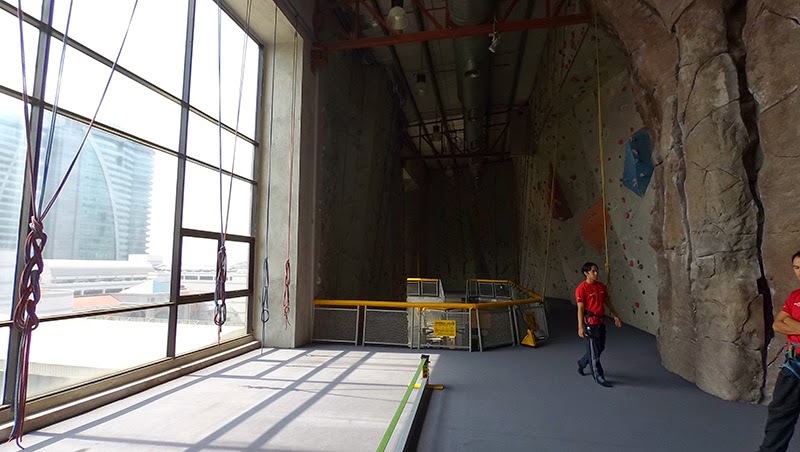 Not to worry you can install the app on your phone (android / apple) and view it on your phone as the pictures gets uploaded via wifi and password protected (so your "adventures" don't get into the wrong hands). The cool part is, it looks like a mini submarine thingy and I personally think it's like a spy camera where you can just bring it anywhere, start snapping pictures like nobody's business (people also don't know what you're doing lah). Designed for you to take on your adventures and click click away producing high quality images and videos, if you have money, this baby is dam cool to play. P.S: I was told you can even wifi upload the pictures to the "awan" so someone back home can also view what you're doing. This is pretty useful for gf's to "nicely request" boyfriends to snap away when they're on holiday (apart, like why?) and see WHAT THEY'RE REALLY DOING LAH. K I sound like some insane jealous gf now (but I ain't nobodys gf so don't worry no poor guy is going to suffer). 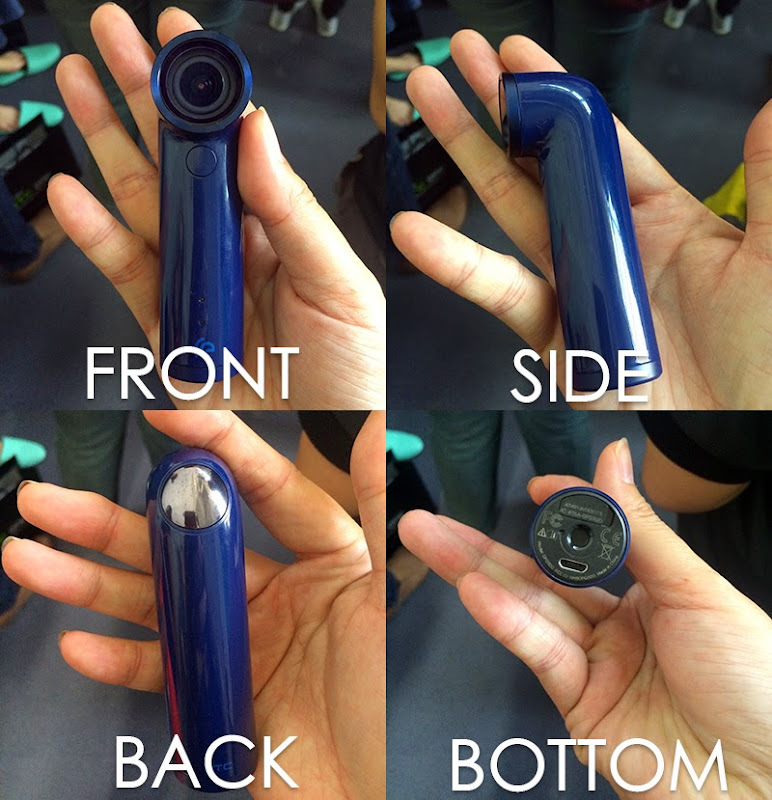 Personally, I think the HTC Re camera is soooo cool. I mean come on, snapping away during events not even bothering looking at the view finder? People are going to think I'm some weird chick or really high-tech man. I also imagine going to Bangkok and snapping away under the rain or in the swimming pool because this camera is WATERPROOF. Well anyone wanna buy Christmas present for me ahem... I like it in Orange (there's only 3 colours available; Navy, Orange and White). It looks so cool, i want to buy this.